This program sets up a two-player, two-decision game, e.g. Prisoner's Dilemma, Coordination, Matching Pennies, Battle of Sexes, etc. You can set payoffs, the matching protocols, and the numbers of rounds. 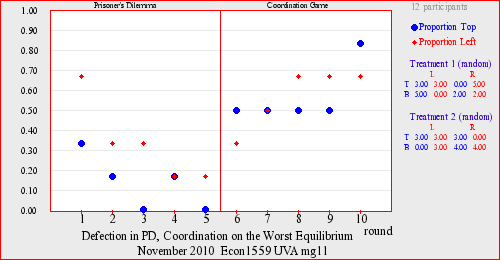 Major strategic paradigms (social dilemma, coordination, and randomization) are implemented with the default setup. For an analysis of payoff factors that may generate intuitive deviations from Nash predictions, see Goeree and Holt (2001) "Ten Little Treasures of Game Theory and Ten Intuitive Contradictions," American Economic Review.